Eurocom all-in-one Mobile Servers are engineered for today’s professionals that require on-the-go server capacity to run mission-critical applications. The increasing mobility of today’s workforce has increased the need for professionals to work in the field in an office like environment; with no dip in hardware capability. “We have customers using our Mobile Servers for a wide range of professional applications such as software development, engineering and design, geographical information science and simulation among others. Customers are coming to Eurocom for the Panther because they trust the quality, reliability and performance the system offers them” Mark Bialic, Eurocom President. A Mobile Server serves the information needs multiple users from a central source. Turn the tangled mess of your businesses computing tools into an integrated all in one server for an easy to use mobile server infrastructure that can be up and running in minutes. “The Panther 5SE is perfect for organizations relocating operations that require fast network setup to eliminate staff downtime. Startup companies can have an entire network server, for 20-50 users, running in one box. We have customers using our mobile servers as a backup in case their production server goes down, they can load the virtual machine on to the mobile server for production purposes while the main production server is down. The more professionals we speak with about the Panther 5.0SE the more creative and beneficial uses we see. Having a multitude of unconnected computers and other tech equipment may be costing you time, money, resources and customers. A mobile server could be the answer” Mark Bialic, Eurocom President. 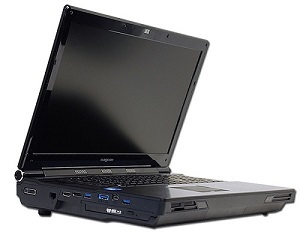 A Eurocom Mobile Server provides a good foundation for setting up a business or relocating an existing one, while offering the ability to take server capability on the go for projects. A Eurocom Mobile server provides a good foundation for starting your business, with an easy setup and the ability to scale up the processing power and capability, the Eurocom Mobile Server is the perfect solution for startup companies or those expanding operations. Connect your employees together with a Eurocom Mobile Server for the ultimate in collaboration and team work with the ability to easily and securely share resources. Centralize your files so everyone has access to the same resources and latest versions on demand, when they need them. Mobile Servers simplify businesses use of shared software resources by providing users with access to centralized resources for those in the network while on the go. The Eurocom Mobile Server allows startup companies to implement an easy server infrastructure from day 1, in minutes. A Eurocom Mobile Server is so easy to use there is little to no server training required as it is a fully integrated All in One Design with integrated keyboard, display, touchpad and battery (UPS), it’s just like operating your laptop! The EUROCOM Panther 5SE significantly reduces the cost and time of deploying LAN based solutions and of extending usage of existing business applications to users wherever required. The Panther 5SE Mobile Server is perfect for organizations relocating operations that require fast network setup to eliminate staff downtime with overhead associated with traditional server rooms. Technically, there is no server room required to get your organization or workgroup up and running. Startup companies can have an entire network server, for 20-50 users, running in one box. Equipped with a built in uninterruptible power supply (UPS) in the form of a 78.44Wh lithium-ion swappable battery pack, which offers upwards of an hour or backup power in case of electricity failure, allowing for safe and secure shutdown after power loss. An external 300W AC Adapter / power supply reduces internal heat generated inside the system and it also creates a smaller, lighter chassis that requires less ambient cooling than traditional servers. The EUROCOM Panther 5SE Mobile Server is an all in one system with a built in keyboard, display, touchpad and uninterruptible power supply that results in a compact, easily mobile, server solution. It is designed for world wide deployment and easy network set up. It is easy to transport, move around and relocate as it can fit into a single carrying bag because of its all in one, compact design. A Eurocom Mobile Server provides enhanced security features other servers simply cannot match. When travelling a Mobile Server can be simply packed in a small bag or piece of luggage, for no need to check your mobile server while flying or ship your server and the potential loss of security both of those options entail. The EUROCOM Panther 5SE provides fast deployment right out of the box, combined with easy relocation. The ability to hand carry the system make the EUROCOM Panther 5SE an extremely easy system to travel with while providing server capabilities. Unlike conventional servers the EUROCOM Panther 5 Server Edition weighs just 12lbs/5.5kg and is equipped with an integrated keyboard, 17.3” LCD Display, touch pad and Uninterruptable Power Supply (Battery Pack). The EUROCOM Panther 5SE is driven by a complete line of optional 6, 8 and 12 core Intel Xeon E5 2600 V2 Processors, based on the LGA 2011 processor socket. The top of the line Intel Xeon E5-2697 v2 has 12 cores, 24 threads, 30 MB of L3 cache, running at 2.7 GHz, supports Intel vPro Technology, Intel Virtualization Technology, Intel Hyper-Threading Technology and Intel Virtualization Technology for I/O. EUROCOM Panther 5SE uses quad channel memory, and enables the Panther 5.0SE to support up to 32GB of DDR3 1600MHz RAM via four 8GB SODIMM 204 pin modules. With such massive amounts of RAM available, the Panther 5SE becomes a great tool for virtualization and server class environments.